Currencies: ZAR, USD, GBP, EUR, NZD, AUD, CAD, SEK and others. Support: email, callback, telephone, FAQ, live chat. Get ready for a cruise-themed adventure like you have never experienced before. Casino Cruise will reel you in, hook, line and sinker. It’s time to go fishing for mega-money jackpots. Casino Cruise is an adventure on the high seas. You get to enjoy 1,200+ online casino games from the world’s leading game providers. These include Microgaming, Net Ent, Play’N Go, NYX, and Evolution. The nice thing about playing at Casino Cruise is that all games run smoothly and you can enjoy one-wallet access from your desktop, smartphone or tablet. All the games run direct off your browser, no download required. You simply pick a game from the many available categories including: video slots, table games, video poker, classic slots, jackpot games, custom games and other games. If you’re in the mood for something decidedly different, you may want to check out the live casino games. These are just like the fantastic games you could play at the Palace of the Lost City, The Carousel or Caesar’s Palace. It’s great gaming South African style. Where else do you get such an incredible international variety of games with mega-money payouts? Most of the games are slots, and there are super titles available to you. Check out the new games, such as Gonzo’s Quest, Piggy Riches, Jungle Jim El Dorado, Hugo, Starburst, Blood Suckers and Fairytale Legends. You can go down the list by clicking on the ‘Load More’ button. All the gaming outcomes are guaranteed random and they are RNG certified. Casino Cruise is approved by the Testing Agency Services. Further, it is 18+ secure, GA compliant, SSL verified, Responsible Gambling Trust endorsed and fully regulated. This means that players needn’t worry about anything other than having fun. All in all, that adds up to an incredible $1,000 in bonus cash over your first 4 deposits at Casino Cruise. Your free spins are available to you in increments of 20 for the first For 10 consecutive days – starting the day after your first deposit – 20 Free Spins will be waiting for you each day on Starburst* at 12:00 GMT. Your Free Spins are valid for 24 hours. There are loads of other promo offers as well. These include The Tuesday Pool Party. This promo offer rewards you with up to $100 in bonus cash when you make a deposit on a Tuesday. The Monthly Splash Bonus is a great way to increase your cash with 2 x 50% Reload Bonus offers up to $100. This promotion runs on the first Wednesday of every month at Casino Cruise. Players looking for a dreamy vacation will be thrilled with the Win a Dream Cruise Vacation. This promo is plenty exciting and SA players will have an opportunity to compete for an all-expenses-paid luxury cruise to an exotic destination. Other offers include Cash Points, Captain’s Treasure and Captain’s Club for VIP Players. One of the most exciting promo offers is the Weekend Freebie. As its namesake suggests, you get awarded free gifts at random, from Thursday right through the weekend. It’s pretty exciting and it is a great way to pack your weekend full of treats. Whenever you need assistance, Casino Cruise is there for you. Customer service agents are expertly trained to help with technical questions, registration questions, deposit/withdrawal issues, gaming and others. Simply send an email or give them a call. The email support address is the following: support@CasinoCruise.com. The email for sending ID, utility bills and other documentation is the following: docs@CasinoCruise.com. Callback functionality is available too. Various telephone numbers are posted for players in Austria, Canada, Malta and Australia, and SA players are welcome to call any of those numbers for assistance. Perhaps the easiest way to get in touch is the live chat option. You simply enter your name, or leave it anonymous, your email address, the subject and your message. A live chat agent will get back to you on the double. Luckily, customer support is available in multiple languages including South African English, UK English, Russian, Swedish, Norwegian, German and Finnish. 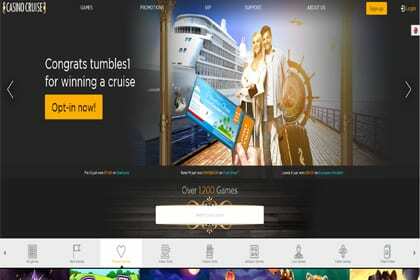 How is Casino Cruise different to other online casinos? First of all, this is a cruise-themed online casino powerhouse. It is a floating city of 1,200+ online casino games. The mobile gaming options are phenomenal, and players have hundreds of games to enjoy on Android and iOS devices. As for the promotional offers – they are unbeatable. Casino Cruise spares no expense in delivering A-grade promotions to players in SA. One of the best features of this online casino is its multivendor platform. Simply put, this means that the world’s top software providers have come together to offer players a huge variety of games. The customer support is exceptional and they even speak SA English. If you’re looking for an established and reputable brand that has MGA and UK GC licensing and regulation, look no further than Casino Cruise.